Any brewer who has tried to make a good, wild fermented ‘hard’ lemonade will tell you it ain’t easy. When wild fermenting an alcoholic beverage we have two options: to ferment in an open crock and stir often within the first few days to incorporate ambient wild yeasts; or make a wild yeast starter about 3 – 7 days before you plan to brew. Frequent wild brewers will have a starter going all the time, and the starters I favour are the ginger bug, raisin water, or a combination of the two. Let’s look at the starters first. A ginger bug is the traditional starter for ginger beer, and it’s easy to make. Organic ginger will have plentiful wild yeasts on the skin, so first, we take some organic ginger, wash it, and then either grate or finely chop it, skin and all. Prepare two tbsp of ginger, and add it to a 500 ml or larger jar with two tbsp of organic raw sugar, and two tbsp of filtered or otherwise chemical free water. Give this a good stir a few times during the first day. On the second day, add two more tbsp of each of the ginger, sugar and water. Stir some more during the day. Give it a shake with the lid on, you should start to see some bubbles, which will tell you the yeasts are going to work. As the yeasts feed and complete their life cycle, by day 3 or 4 you should be seeing a sediment of spent yeast cells in the bottom of your jar. Add 2 tbsp of ginger, sugar and water until the liquid is alive and bubbly. It is ready when it is full of bubbles upon shaking, and when opening the lid of the jar releases with a hiss the CO2 that the yeasts produce as they feed. Organic raisins also have plentiful wild yeasts on their skins. 1 cup of organic raisins is added to 2 cups of clean water, and left to ferment for 4 days. By this time, you will see plenty of large bubbles clinging to the raisins, and lots of small bubbles when the jar is shaken. This is low maintenance, and is ready when it is well and truly alive and bubbly. Use any combination of the two starters to ensure good results. Stirring is not as important in the early stages, and this will produce a good, lively wild starter after four days. It isn’t necessary to add ginger every day, and sugar is only really needed on day 1 because the raisins have plenty of sugar. OK, so your starter is primed. Place the starter in a warm location (about 30° C is ideal), and get on to making the lemon ‘mash’. While not technically a mash, this uses a similar technique to malt mashing in beer brewing to produce a lemon wort (rhymes with ‘dirt’). Bring 4 litres of clean water to a boil. Add 1 kg of organic raw sugar, a handful of chopped ginger and about a dozen crushed juniper berries. Simmer this for half an hour. Meanwhile, slice 5 lemons and remove all the seeds from them. Juice 4 more lemons, and add this to the cut slices in a bowl. 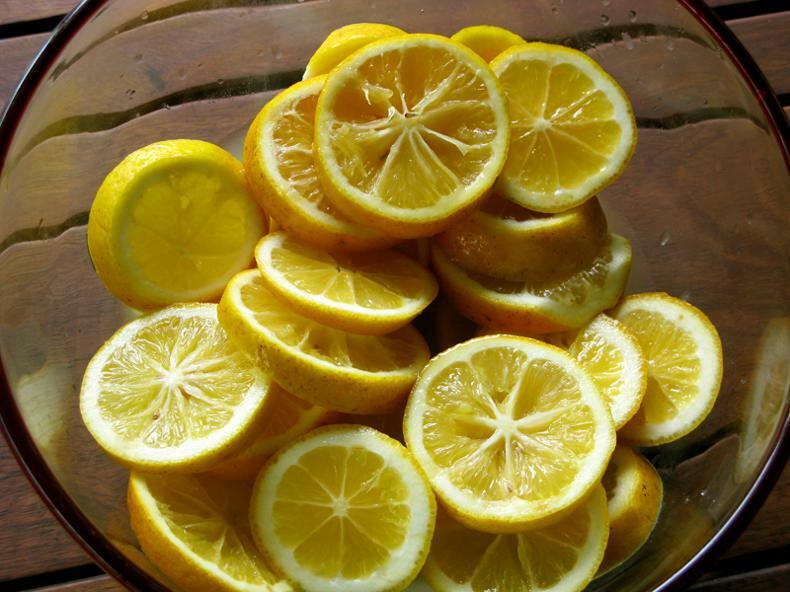 After the sugar water has simmered, add the lemons and the juice and simmer for another 10 or 15 minutes. Leave this to cool. The lemon wort needs to be cooled to 30 - 32° C. The organisms of fermentation are alive, and they are killed by higher temperatures. I like to use babies and bees to illustrate this point. Bees are pretty good air-conditioning engineers – they never let the temperature in their hives rise above 32° C because they rely on key bacterial species (as do we all). Babies know nothing about air-conditioning, but imagine you are about to give a newborn their first bath – this is the sort of temperature we are looking for. Once cooled, strain the solids from the liquid, and decant to your fermenting vessel. I am using a 5 L (roughly 1 Imperial gallon, or 1.3 US gallons) glass carboy, also called a demi-john, or even a growler. 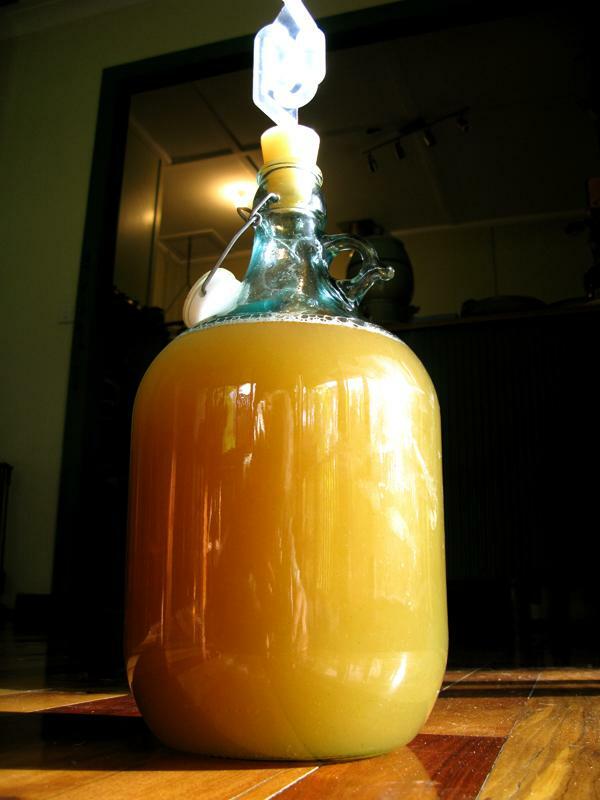 Strain your starter, then add the liquid to the carboy. Top up with filtered or otherwise chemical free water, leaving a little space for foam. Pop an airlock in the mouth of the vessel, and place it in a warmish spot to ferment. Soft lemonade will be achieved once there is a complete covering of foam on the surface. If your starter is pretty active, this may only take 12 hours. Leave it fermenting past this point for hard (alcoholic) lemonade. The longer it goes, the stronger it gets. Once it is ready for your tastes (decant while still active for a sweeter drink with less alcohol, or let ferment until activity in the airlock all but ceases for a dry, strong drink). Place in bottles to condition, this will carbonate, and the sweeter it is, the more CO2 potential there is, so be careful. A couple of days on the bench will be plenty for a sweet drink. Refrigerate when carbonated, and drink quickly. Carbonated drinks in glass bottles can and do explode. I have only had 2 explosions over many, many brews. The best way to monitor carbonation is to decant some into one plastic bottle and use this as your pressure gauge. Squeeze this bottle every day, and when it becomes difficult to squeeze the sides, move all bottles to the fridge immediately. 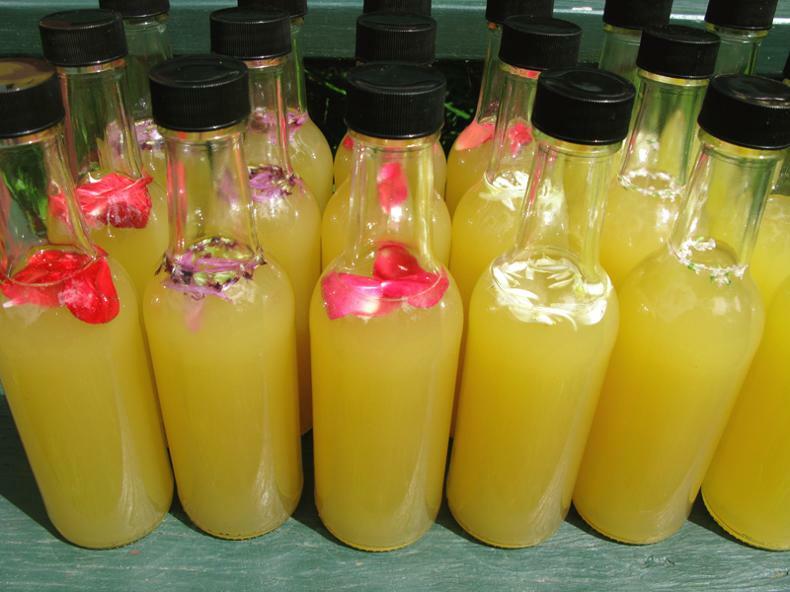 From the picture above, you will see that I have added some blossoms to this batch of lemonade. The ones used here are: geranium, lavender, rose, lime, and thyme. Each blossom brings its own flavour nuance and medicinal properties. Experiment with your own, just make sure the flowers are edible!